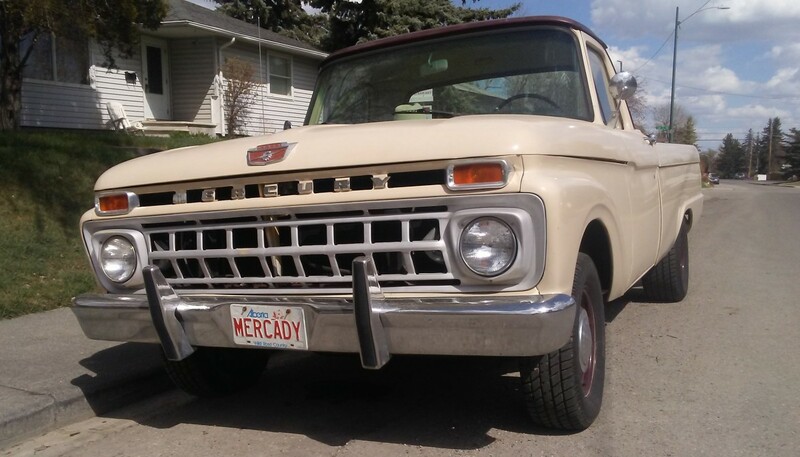 CC reader Peter N. sent me these shots of a Canadian Mercury pickup, which would be a ’65 if its grille is consistent with the US Ford version. I need to convert my ’66 into one of these, to really confuse folks down here. 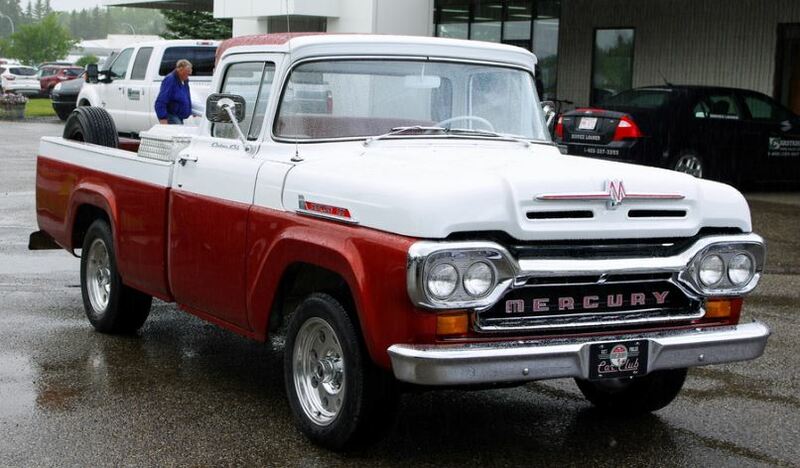 David Saunders did a full post on the history of Mercury pickups here, but to make a long story short, in Canada Mercury and Ford dealers both sold a wide range of cars, since there was often a low density of dealers. 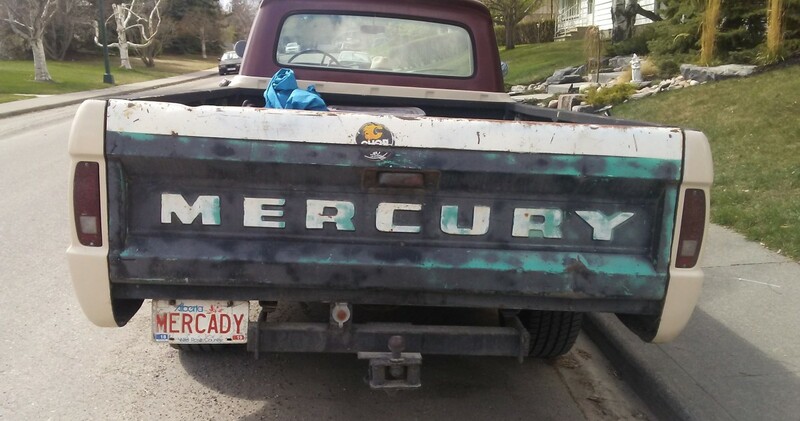 Hence the Mercury truck. Like the ’61 Bel Air we saw here the other day, this does not look like an original paint scheme, although there was a tan like that. But I’ve never seen one with a burgundy roof cap. Just one problem: that panel that supports the MERCURY letters is of course different than the one on my truck. So that would need changing too. I saw a Mercury pickup very much like this several years ago here in Oregon, but never got a chance to snap its picture. Yes you should it would make a lot, ok some, people do a double take. There was a Mercury pickup of this era that I used to pass regularly many years ago. However it was wrecked and rusted beyond repair or even being a donor to convert a lowly Ford. 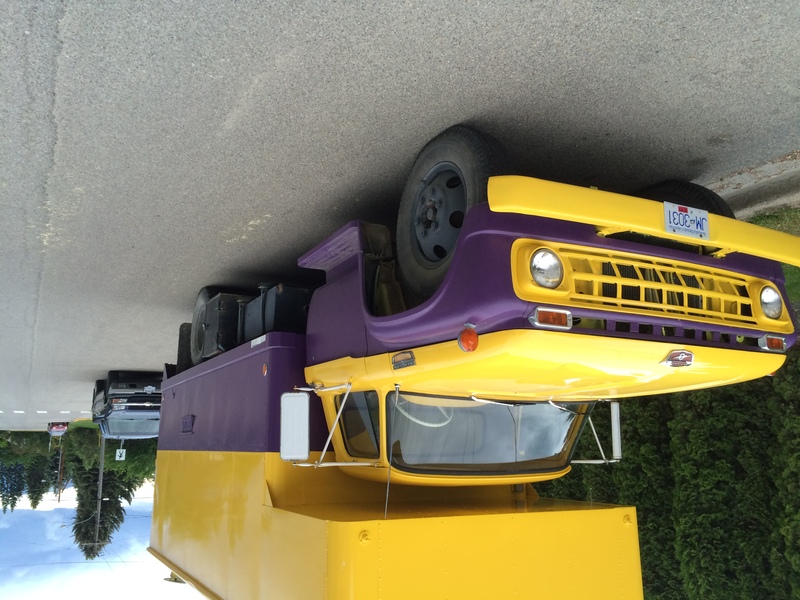 Here’s a pic of a restored Merc M-600 I found in Creston, British Columbia a few years ago. Judging by the way that it’s parked, I would have guessed that it was south of the equator. It loaded right-side-up for me when I viewed large. Must have really been upside down on the cost of the restoration. Back when I was in high school (wow, was that really 20 years ago?) I saw a Mercury pickup of similar vintage to this one parked in front of a tire shop. And yes, I was really confused by it at the time. I did not know about the rebadged Canadian variants back then (or other Canadian cars for that matter). In fact I only just recently learned about them from this site. Just checked, no 65 Mercury pickups for sale locally. Maybe DS is in a better location to help you with that one. As close as I could find is a 66 with the six and three on the tree. Theres a few M100s kicking about in NZ why I dont know except our Fords were all Canadian CKD packs so maybe a few Mercurys got included just for laughs and of course recent imports of something completely different. Anyhow I am quite sure that some Mercury badging on your truck would bring a dramatic improvement in ride quality. Got it! I think you’ve combined elements of two Mercury ads. I couldn’t find the diamond cutter one, but here’s the blindfolded chauffeurs. Saturday Night Live did a famous parody of the diamond-cutter ad. I was about to comment on the SNL parody. The Internet never sleeps, my friends! 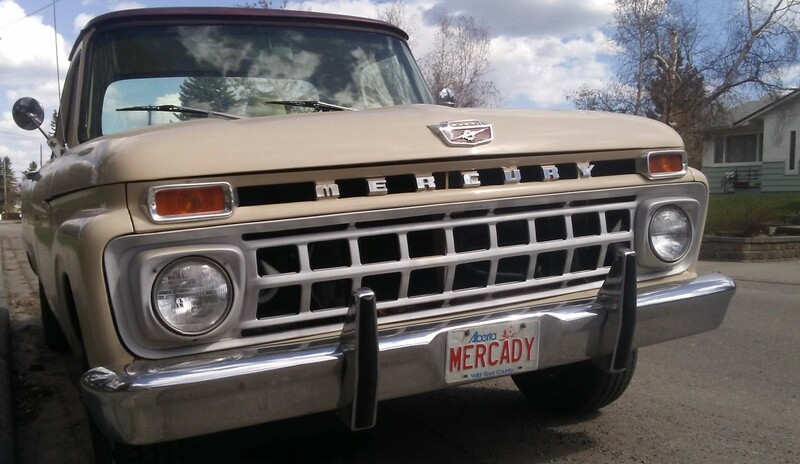 I wish I had a picture of my Dad’s Mercury pickup from the early 70’s. 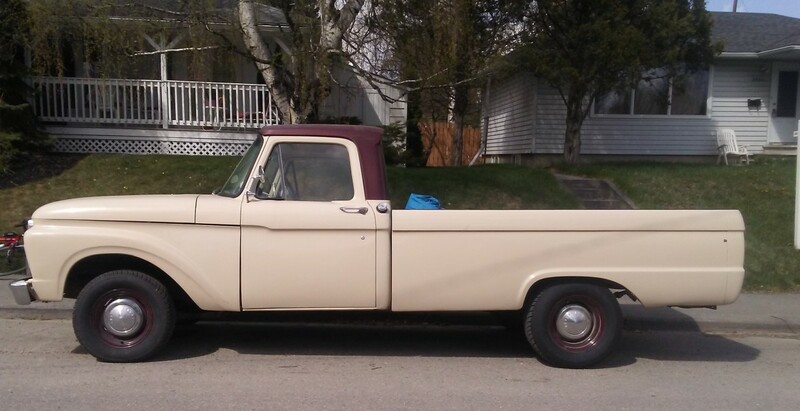 It was a 1968 which was the last year for Mercury trucks. It was a higher trim edition so nice interior and trim. It had automatic and a 390 v-8. Although originally yellow in colour it had been done in red with a black painted roof. As a crowning 70’s period touch it had a set of Cragar SS mags! Now that was a Mercury to be crazy about! To convert you already know about the tailgate which is hard as hen’s teeth to find. 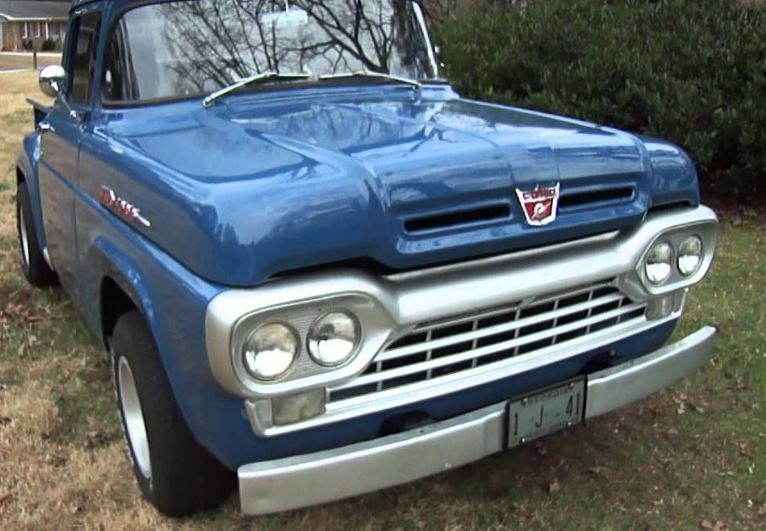 Equally hard is an anodized 1965 F-100 (one year only) grille. I have a spare which would cost someone big bucks to get their hands on. Forget the portion above the grille to hold the seven MERCURY letters vs. the FORD letters. Paul, the front panel that supports the M E R C U R Y letters is the same. The factory welded on extra supports for the E C and R. The M R U Y are mounted to the supports normally used for the F O R D.
I compared two identical trucks at a car show recently… one was a Ford and one a Mercury. It would be very easy to convert your Ford if you chose to. Imagine the confusion at the DMV when you register it!